Why Should YOU Attend the 2nd iLead Conference? If you missed the first iLead Conference because you needed to prepare for your finals (like I did) and thought that the opportunity knocks but once, well, I come bearing good news! Hosted by Taylor’s University Life Skills Development, the iLead Conference is back with a new panel of key industry speakers and personalities who have initiated significant contributions and will be sharing their experiences with the aim of inspiring students to be successful leaders themselves in the future. The conference will be held at LT21 and 22 on 3 October, 2015 (Saturday) from 9am to 5pm. 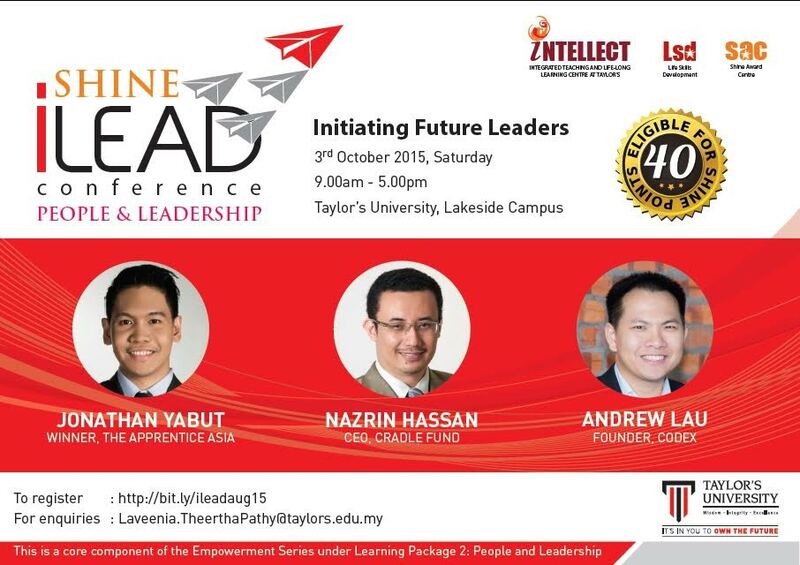 The 2nd iLead Conference will see the presence of the winner of Apprentice Asia, Mr. Jonathan Yabut, CEO of Cradle Fund Sdn Bhd, Mr. Nazrin Hassan, and the CEO of Codex (previously the Head of Campus of Leadernomics) Mr Andrew Lau. Under the banner aptly named Initiating Future Leaders, Mr. Yabut will be talking about personal leadership during his session titled From Grit to Great: Lessons From Apprentice Asia, while Mr. Hassan will touch upon the aspect of leading others in his talk, Influential Leaders: The Art of Leading Others. Last but certainly not the least, Mr. Lau will be presenting his speech: Creating Change For A Better Future, which is about inspiring action within us. “From my experience, I think that the first iLead Conference was an astonishing event that connected many students of Taylor’s University Lakeside Campus with the top employers and managers. I would strongly recommend my friends to attend the upcoming 2nd iLead Conference as there will be more employers who will be sharing their successful life stories to inspire the students on how to be successful in their own field of study”. In addition, if you happen to be a SHINE student, you will be eligible for 40 SHINE points by attending. The iLead Conference is a core component of the Empowerment Series under Learning Package 2: People & Leadership. If you are participating in the iLead Conference for the first time, you can sign up via the Shine Portal at https://shine.taylors.edu.my. However, if you have already attended the first conference and claimed your points/attendance under LP2, but wish to attend the 2nd for additional points, you may sign up here: http://bit.ly/ileadaug15. As per the usual procedure for obtaining additional SHINE points, you are required to submit an individual reflective submission on the 2nd iLead Conference upon attending. This must be supported by evidence such as photographs during the conference and the Certificate of Attendance awarded after the event. Convinced? What are you waiting for? Sign up now to save yourself a seat! Tags: conference, development, ETC Taylor's Magazine, ETC., ETC. Magazine, etctaylors, ilead, leadership, SHINE, speaker, Student life, talk, Taylor's student, Taylor's University Lakeside Campus, Taylorians, Taylors, TULC, TULSD. Bookmark the permalink.